Does the title of this post make sense now? We have long been plagued with only 9 notes (okay 11, maybe 12 if you really know what you’re doing). Who’s to say the lowest should be low G? The bagad bands in Brittany have long ago developed a chanter that instead of a low G played low F#. Their chanters (here’s an example) are designed to tune differently however, in that the drones are tuned up to B, meaning the offsets from ET usually used must be applied to one note higher than usual (I think). My drones here are obviously still tuned to low A and I’m not using a Bagad chanter. 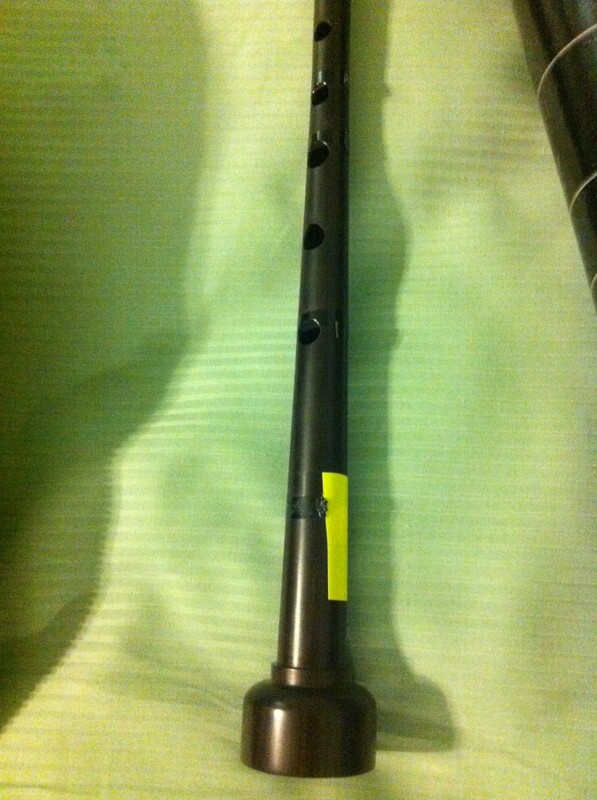 I’m using my Colin Kyo chanter with one of the tone holes taped over (you’ll notice the special bagad B chanters only have one tone hole). I’ve known of this effect for quite some time, but never found a cool enough tune that for the most part only needed the low F# and not low G since you lose low G (in the original score there are some passing low E’s and low D’s but with a little rewrite they disappear). The sheet music I’ve derived for the tune can be downloaded here.